Belgium – famous for beer, Belgian chocolate, Hercule Poirot, and earlier this year it achieved the record for the country with the longest time without a government in modern history. But before the political deadlock, Belgium was also famous for its national dish of moules et frites – otherwise known as mussels and chips. Which brings us on to one of London’s most popular Belgian restaurants – Belgo Centraal – where they’ve been serving mussels and other Belgian dishes since opening in 1992. Nestled in the heart of Covent Garden, this flagship restaurant of the Belgo restaurant chain specializes in simple Belgian dishes and Belgian Beer at a very reasonable price. Belgo Centraal is on Earlham Street and the subterranean location is very atmospheric. It is noted for its open kitchens and its waiting staff dressed in monastic inspired uniforms. As well as offering a good selection of wines, Belgo is renowned for serving over 70 different types of beer – everything from Stella Artois and Leffe to more unusual fruit beers flavoured with strawberry, banana or even chocolate. The latter perhaps should be reserved for the more adventurous drinker! There is an appetizing selection of Starters to choose from. The Goose & Sauterne Pâté is delicious. Or why not try the Warm Salad of Smoked Bacon, Shredded Duck, Eggs & Black Pudding if you want something more substantial. The Salmon Fishcakes are also very good and come served with baby spinach and lime hollandaise. When it comes to Mains, the signature dish is unsurprisingly the Mussel Pots – a kilo of steamed mussels served in one of four sauces: flavourful Traditionnelle, creamy Marinière, tomato-based Provençale, and oriental Green Thai. 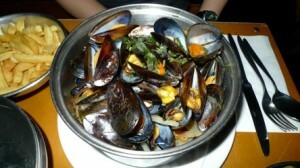 Platters and bowls of mussels are also available for diners with smaller appetites. For those who’d like to try a classic Belgian dish, go for the Waterzooi – a tasty combination of chicken, leeks and potatoes in a light cream & chicken broth. Other popular mains include the Rotisserie Chicken – a half chicken basted in Belgian blonde beer & apple juice and served with a choice of delicious sauces; the Beef Carbonnade – beef braised in sweet Gueuze beer with apples & plums; and the Wild Boar Sausages – served with Belgian stoemp mash & berry jus. If you still have room for Dessert, the Crème Brûlée is highly recommended as is the Brussels Style Waffle. For those wanting to be more indulgent, try the Bread & Butter Pudding or the Belgian Dark Chocolate Cheesecake. If you fancy some fruity liquid refreshment after your meal, the selection of Genever Schnapps is sure to please – the bartender will line up a random choice on a Mixed Stick for that touch of Russian roulette. Belgo have a range of promotions on offer throughout the week. The Express Lunch Menu is available daily between 12pm and 5pm and is a very good deal – £7.95 gets you one of a selection of main courses served with a choice of Cristal lager, a glass of house wine or a soft drink. There is the special “Beat The Clock” menu – every Monday to Friday between 5pm and 6.30pm, your main course costs the price of the time you order, e.g. order at 6 o’clock and pay £6. There is also a reasonably priced children’s menu if you’re treating the little darlings to a meal out. As well as Belgo Centraal, the chain also has restaurants in Bromley, Camden, Clapham and Kingsway. The Belgo brand is owned by Tragus Holdings, which also owns the French-styled Café Rouge chain and two chains of Italian restaurants – Strada and Bella Italia. So, if you’re in the mood for mussels, a visit to Belgo Centraal is highly recommended. Tagged beer, belgium, chips, covent garden, london, restaurant, seafood. Bookmark the permalink.